This is old home week. Twelve years in Essex and with you here at St. John’s. Happy years of Sundays with you; happy Tuesday night suppers with you; and working public issues with you. In those twelve years, I met Renate only once. We’ve been getting a bit closer since October four years ago. That’s when we met at Dulles Airport in D.C. We were on the way back to the North country from major national gatherings for each one of us. And as a congregation, you came to Vermont a little over a year ago. You came for the pastoral oversight of Tom Ely, Bishop of Vermont. I heard you were coming too late to be at the diocesan convention to welcome you. Now, a belated welcome to Vermont. You will be well cared for by Tom. Those 12 years in Essex, I knew more of Judy Moore than of Renate. Jennifer, her daughter, was at that organ for several years. I’m delighted she is back there now. I am even more privileged to be here as one of the Judy’s sponsors for baptism. Baptism has a story too. There is John the Baptist. He is our door to Advent. He foretells the coming of Jesus. He baptizes him in the Jordan River. Baptism was important for the first 4 centuries, but it began to drop into the background. Then as recently as the 1850’s it took center stage again. It happened in Africa where lots of people were being baptized. Those Africans even got into preparing people for baptism for three years! Our recovery of baptism here in the USA came after World War II. We recovered the sense that you become a full Christian in baptism. Your baptism in not completed when you are confirmed by a bishop. Even infants join God’s mission in baptism. That’s a good way to understand baptism – baptism is joining God’s mission to make the world more loving and more just. Did you know that is was the recovery of baptism that meant we had to rewrite the Prayer Book? The 1928 book put Holy Communion at the center with baptism 184 pages later. 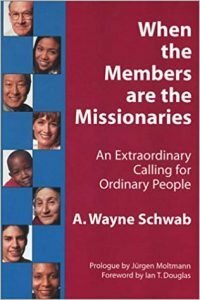 The 1979 book puts Baptism first. Then comes Holy Communion. You become a full member of Jesus’ people at baptism. You become an agent of Jesus’ mission – God’s mission – to work for wherever you are in the world to be a more loving and just place – now. – all of these as well as the part we play in church life and its outreach. That’s quite a list. Actually, all seven of these come up in one way or another each week. You don’t live all seven all the time. Each comes up one at a time. You do the best you can in each one. The readings for today – they were all about being more loving and more just. Look at Isaiah – “beat those swords into plowshares.” Live peaceably. What’s that like? Don’t listen to the market for an answer. The market tells us we are consumers. The market sells us short. Peace, justice, the common good are far from the minds of consumers. We are citizens, first! We are called by God to be part of making our common life more just. Work for peace in our common life by working for justice, for the common good. Here’s a way to do it that will surprise you, I suspect. Watch just plain old chats – chats in the supermarket, chats as dinner guests, chats at Christmas parties. We are so cautious about justice issues, about the common good! The biblical writers are not – not the prophets, not the psalmists, not Paul, and, especially, not Jesus. Each of our readings comes from writers who know the lack of love and caring in private life; and the lack of justice and love in public life. We are agents of God’s mission to make the world more loving and more just. We became these agents in baptism. That’s what I pray you see that baptism is. Baptism is joining Jesus’, God’s mission to make all of life more caring and more fair. Now focus with me on baptism. People come to baptism for many reasons. Many who come have been agents of love and justice for some time. They have been on God’s mission for some time – some know it, some rejoice to say so when they come to baptism – “We are coming home to how we have been living for a long time.” Many come for other reasons. What happens when they come? That’s what counts. See the mystery of what we are doing here. We are God’s people here at God’s table, Jesus’ table. God is feeding us the power and direction we need to live the mission. That’s the mystery of this bread and this cup. Somehow, we are fed. Somehow, our thirst is met. Being fed is a mystery but it’s real. The bread in our hands; the wine on our lips; they reassure us. We need these outward, visible signs of God’s presence and power – reassurance that God is among us – God is helping us! There is One beyond us holding us accountable for each day. And this same One helps us to live better. The bread and the wine – we feel them, taste them – reassured we are of God’s help. There’s an old-time hymn about assurance of God’s help – “Blessed assurance, Jesus is mine.” That’s a little possessive. We don’t own Jesus. Better is “Blessed assurance, Jesus in mine, too.” Better still is “Blessed assurance, Jesus is ours.” Jesus’ Spirit is everywhere. Thanks be to God. Jesus, God, the Spirit are present with Judy – with all of us all of the time – whether we know it or not.